Elegance is an ambiguous term difficult to explain. For years, people have sought to find a simple and clear definition for it. And even various explanations have been tailored, keeping every time the essence and nature of the term itself, nowadays there is not yet a well-defined description to stand for this word. The amusing thing about the meaning of this term is that even elegance might be considered an unclear concept, everyone is able to recognise it when it springs. And that’s exactly what happened during this graceful wedding. But we don’t want to continue this post without mentioning how grateful we are to our lovely couple A&G, for choosing and trusting us for making this day come true. Thank you guys for helping us to make our passion real. Attention to detail without boundaries. Starting from the location, a fully renovated villa with Andalusian hints all around, located just few steps away from the seashore. Villa del Mar is one of the most luxurious and high criterion villas you might find in Spain. Bounded by the Mediterranean Sea and a couple of minutes away from the heart of Marbella, this villa was the perfect scenario for the day. The ceremony was held in the entrance of the villa. A remarkable white catwalk guiding to the Houppa was set. The rumour of the water falling from the middle fountain and the background chant from birds did just enhance the beauty of the place. 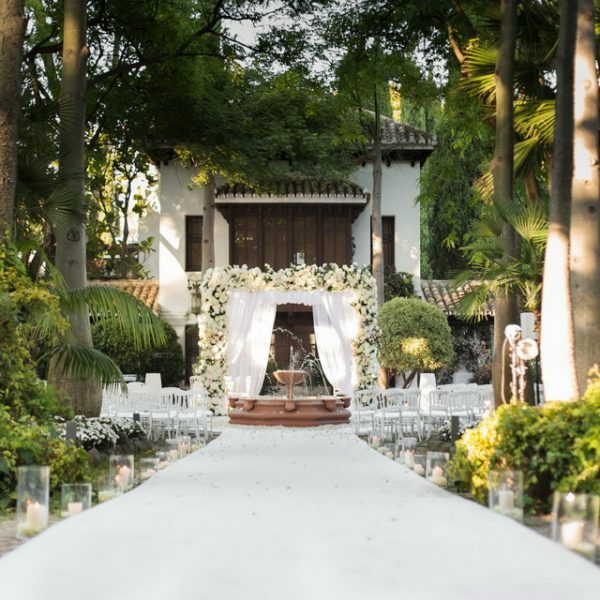 White Tiffany chairs were surrounding the white path and the most tasteful and refined Houppa you could ever imagine. Big thank you to Pedro Navarro and his team for the hard work. Once again, you went beyond expectations! The main characters of the Houppa were hydrangeas, roses, peonies and viburnums in white, ivory, misty pink and blush colors,; the perfect blend for this frame. But best was yet to come. For the banquet clean and neat lines were followed. In order to accomplish this setting round transparent perspex tables were used, that together with the transparent Napoleon chairs create the precise balance between classy and trendy. The mixture of bohemian glasses and the latent touch of the baroque charger plate were the final dash of this affair. Tons of candles and fairy lights helped us creating a cosy and warm atmosphere for the night. Muzika, the band, was also a remarkable feature for the success of the evening. The English group was the responsible of making everyone dance throughout the whole event. Thank you guys for your liveliness! Thank you to all the suppliers involved during the whole set up of the weeding and the previous preparations. And a big thank you too to the staff of the Marbella Club. We couldn’t have made it without all of you.